Last week I got a call from the Bicycle Federation of Wisconsin asking for a few elevator statistics about bicycling in Milwaukee. 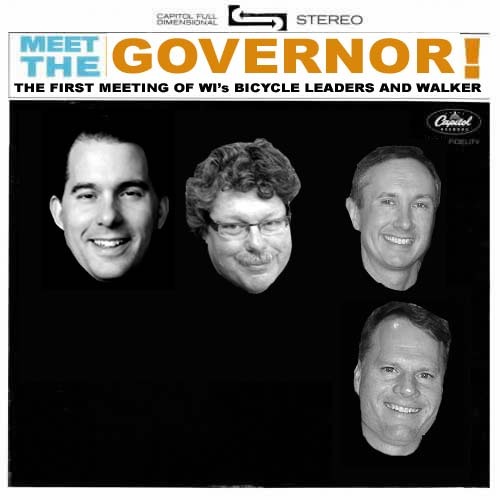 The staff person told me that BFW Executive Director Kevin Hardman and some bicycle industry leaders would be meeting with Governor-elect Scott Walker on Friday Dec. 17th. I was happy to supply them with a few good statistics and anxious to hear how the meeting went. I spoke with Kevin yesterday afternoon and he gave me a nice run-down on how the first face-to-face between the bike people and our state’s next governor went down. OTBinMKE: Before we get into other details of your meeting, I have to say I saw on Chris Kegel’s Facebook page that the governor-elect agreed to the UPAF Ride going over the Hoan Bridge. That is huge, how did that come about? Chris just straight up asked him and Governor-elect Walker committed to work with UPAF to try to get the ride over the Hoan Bridge this year. It was very positive. Dave interjecting here. I think this is a really big deal if it happens. It could really boost ridership and generate more income for the United Performing Arts Foundation. It could also introduce a lot of people to how easy it is to ride over the Hoan Bridge and the wonderful view of the lakefront. If it never goes any further than that, it is a wonderful beginning to a cooperative relationship with our soon-to-be governor. I will update this story with more information after I get in touch with the UPAF ride coordinator. OTBinMKE: Who was at the meeting? I attended the meeting with John Burke, the president of Trek, and Chris Kegel of Wheel and Sprocket (also the new Chair of the BFW board). OTBinMKE: We all know that our issues are bike-partisan, but what message did you lead with? We led with the message that bicycling is big business in Wisconsin. It means $1.5 billion dollars for the economy and 13,000 jobs. Obviously jobs and growing the economy are the topics of the day. We were able to leave behind our economic impact study and a fact sheet on bicycle businesses in Wisconsin. OTBinMKE: What issues seemed to resonate most with Gov.-elect Walker? Well obviously jobs and industry, but what really seemed to resonate was the idea of all these wonderful rides we have across the state, from charity rides to races. These rides bring in lots of people to the state or to different communities within the state and the people stay and spend money. It seemed that Governor-elect Walker liked the idea of growing these events and rides as tourism assets. OTBinMKE: Did you discuss funding, complete streets and federal requirements to include bicycle and pedestrian accommodations on all projects, and other things like Safe Routes to School or the BFW’s Share and Be Aware program? No, as I mentioned, the intention of this meeting was to form a foundation on which we can build a relationship. We felt those issues were too specific to bring up this early. OTBinMKE: Did you leave the meeting feeling generally positive or do you think people who ride bicycles and the bicycle industry have a lot more work to do in order to make the case for continued investments in cycling infrastructure? I left the meeting very excited about the opportunity to work with Governor Walker and his new administration. He even suggested we might organize an annual governors bike ride. We were only scheduled for 30 minutes, but he was genuinely engaged and the meeting went about 50 minutes. Whether you are republican or democrat, for rail or against it, if you are reading this blog, you are probably someone who wants to see things continue to improve for people riding bicycles in Wisconsin. We have things pretty good comparatively here in Wisconsin, and if this meeting is any indication, things could continue to improve under the next administration. If you live in the real world and want to keep that trend going you need to work with whomever is in the governor’s office and in the state legislature. Many of our strongest bicycle advocates in Wisconsin are republicans. US Congressman Tom Petri (R-6th Dist.) has been a tremendous asset for example. Our state leadership in cycling industry as well as our position as a great bicycle destination all supercede the politics of the moment. I completely understand that most readers of this blog are not single issue voters, neither am I. I have been in many meetings like the one described above at both the National Bike Summit and the State Bike Summit, both with known bicycle allies and those who oppose investments in cycling. Some meetings went well, and others did not. But no matter the result, I appreciated the an honor and a duty of being able to participate in our democracy and help bring the positive message that is bicycling to our elected representatives. I think this is a good first step for cycling and the new administration. If nothing more than a legal bike ride over the Hoan Bridge comes out of this meeting, it was a success. 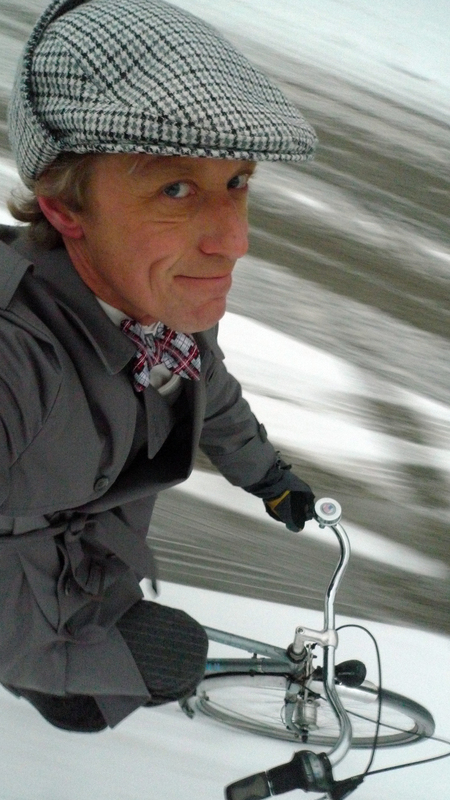 I tip my hat to our state bicycle advocacy and industry leaders for their efforts on our behalf. Sounds like great news! Thanks for the update Dave! As soon as I heard that Summerfest was hosting a run over the Hoan I thought they should have the ride for the arts go over it as well…this will be great. If Walker sticks to his intentions of wanting to boost economy thru tourism, helping the cycling world would be a good way to start.